Bund Gardens [Mahatma Gandhi Udyan], Poonah [Pune]. bl.uk > Online Gallery Home	> Online exhibitions	> Asia, Pacific and Africa Collections	> Bund Gardens [Mahatma Gandhi Udyan], Poonah [Pune]. 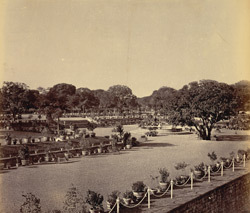 Photograph of the Bund Gardens in Pune from the 'Lee-Warner Collection: 'Bombay Presidency. William Lee Warner C.S.' taken by an unknown photographer in the 1870s. Pune is situated at the confluence of the Mutha and Mula rivers south-east of Bombay in Maharashtra. In the 18th century, it was the capital of Raja Shivaji, the Maratha king who defied the Moghul emperor Aurangzeb. In 1817, the British gained control of Pune. They based the summer headquarters of the Government of Bombay here and established a large military cantonment. The Bund Gardens lie on the bank of the river near to a bund or dam. The gardens were financed by the businessman and philanthropist Sir Jamsetjee Jeejeebhoy (1783-1859). They are now known as the Mahatma Gandhi Udyan.